1. Plaintiff, Brian Charles Vaeth, is a resident of Baltimore County, located at 8225 Poplar Mill Road, Nottingham, Maryland 21236. 2. Defendant, the Mayor and City Council of Baltimore City, a municipal corporation, is located at 100 N. Holliday Street, Baltimore, Maryland 21202. 3. Defendant, the Board of Trustees for the Fire and Police Employees Retirement System of Baltimore City is the administrator of the City’s pension plan for public safety employees and is located at 7 E Redwood St Suite 19e, Baltimore, MD 21202. 4. It is alleged that each of the Defendants, along with their employees and agents, participated personally in the unlawful conduct challenged herein and, to the extent that they did not personally participate, authorize, acquiesce, set in motion, or otherwise fail to take necessary steps to prevent the acts that resulted in the unlawful conduct and the harm suffered by Plaintiff, each acted in concert with each other. Their acts directly caused the violation of Plaintiffs’ rights and fraud to be committed on this Court. 5. This is an action pursuant to 42 U.S.C. § 1983 based upon the continuing violations of Plaintiff’s rights under the Fourth, Fifth and Fourteenth Amendments to the United States Constitution. Jurisdiction exists pursuant to 28 U.S.C. § 1331 and 1343 based on 42 U.S.C. §1983 and questions of federal constitutional law. 6. The details surrounding this complaint are a result of previous claims filed in the Circuit Court for Baltimore City, case numbers 24C00005120, 24C03007014, and 24C07009752, which were an appeal of an administrative agency’s unlawful determination of the denial for retirement benefits from the Fire & Police Employees’ Retirement System of Baltimore City and the manner in which the proceedings were conducted. 7. Plaintiff also filed claims in this Court where the alleged fraud on the court that Plaintiff requests of this Court to review to assess if it has been a victim of it, took place. Those case numbers were RDB-08-708 that resulted in US Court of Appeals case number 09-2056 and WDQ-10-0182 that resulted in Court of Appeals case number 11-2122. The United States District Court claims were brought pursuant to the Americans with Disabilities Act of 1990, as amended 42 U.S.C. sec. 12101 et seq., the Rehabilitation Act of 1973, as amended, 29 U.S.C. sec. 701 et seq. (Rehabilitation Act), and the 14th Amendment to the Constitution for allegations of the denial of due process and equal protection under federal, as well as, Maryland State laws. 8. Plaintiff does not contend, nor does he assert, that the Court demonstrated any misconduct at any time herein. To the contrary, Plaintiff alleges that the Court has been a victim due to the level of trust bestowed upon its officers. There is no dispute that the trust was misguided, but when that trust is in question, the Court should get to the bottom of it to ensure that it does not misplace it again and that the proper sanction can be determined. 9. This complaint does not allege any misconduct to be demonstrated on the part of retired United States District Court Judge, the Honorable Andre Davis, who is the current Baltimore City Solicitor, recently appointed to the position. This complaint brings to light the illegal tactics employed by George Nilson, former Baltimore City Solicitor, who was fired in August of 2016. 10. Upon the receipt of newly discovered evidence in 2016 that Plaintiff cites in this matter, he filed a complaint in the Circuit Court for Baltimore City over the matter, but Plaintiff was informed by the clerk of magistrate judge who was handling the case that the relief Plaintiff sought, an order finding the defendants perpetrated their fraud, could not be obtained. Rather than have the Court dismiss it, Plaintiff filed a motion to withdraw the complaint, so it could be filed in this Court. It has been ten months since that filing, and Plaintiff has not received an answer to it to date. As this is the Court where the fraud was perpetrated, the request for an assessment of it is requested in this action. 11. Public corruption is a significant reason for Baltimore City’s problems and there must be oversight, or else municipalities can act arbitrarily under the color of law, as they have in this case and that of many others. This deception is widespread, and it must end. This complaint deals with the actions the defendants directed at the Court specifically in this matter. 13. The City of Baltimore has outright refused to accommodate Plaintiff’s request for this public information. A request under the Public Information Act of Maryland is being filed at this time in the Circuit Court for Baltimore City. 14. After an extensive review of the City of Baltimore’s actions, related to a lawsuit Plaintiff has brought before this honorable Court in the past, it is obvious that the City’s actions leading up to the matter giving rise to that complaint, and their actions in this Court, were corrupt and their defense was tainted with many acts of evasion, misdirection, wrongful acts, and omissions. The scope of the fraud the City of Baltimore has committed is extensive and has undermined not only the Court’s ability to adjudicate the aforementioned case before it, but other cases, as well, and has led to unspeakable tragedies suffered by Baltimore’s citizens. 15. Plaintiff is mindful of the necessarily high standard that is set for proving such a serious allegation and understands the Court’s refusal to liberally interpret the rules to accommodate any claim other than where the essential elements of fraud on the court exists and are conclusive. For that reason, Plaintiff will articulate a claim, through the pleading phase of this action, that will sufficiently demonstrate that the standard for pleading the essential elements of fraud on the court are met and that it was perpetrated on this Court. 17. Plaintiff was a Baltimore City Firefighter, eminently qualified for the position by virtue of the many times he was recognized for meritorious conduct in departmental commendations for the actions he took that placed his life at serious risk while being exposed to extreme heat, very dense smoke conditions, and heavy fire that reflected immense credit on the Baltimore City Fire Department. 19. On March 23, 1999, Plaintiff suffered a recurrence of this injury, required further surgery, and was deemed to be disabled from the performance of his duties by the City of Baltimore. 23. As a result of prevailing in that appeal process, Plaintiff was reinstated by the Baltimore City Fire Department to the full performance of his duties. 25. Plaintiff was “Cut-Off” from his appointed position, as a firefighter on December 28, 2002, leaving him without union representation. 26. In January of 2003, while waiting for the administrative hearing to determine his eligibility to receive retirement benefits to be conducted, Plaintiff was placed into a Vocational Rehabilitation program by order of the Worker’s Compensation Commission with the intent of placing him into employment outside of the Baltimore City Fire Department. 27. During the vocational rehabilitation process, Plaintiff was found to require additional surgery for the injury. Despite this, Plaintiff was still subject to the administrative hearing process without union representation, or legal counsel. 30. Plaintiff did not dispute the hearing examiner’s decision despite it being in error. Plaintiff never asserted that he was disabled and therefore, the determination that he was not is consistent with Plaintiff’s assertion throughout all times relevant in this matter. Plaintiff’s disability was assumed by the City of Baltimore under policies that they adopted, and the hearing examiner contradicted their assumption in his findings of fact. 31. While Plaintiff did not dispute the decision, it left him without disability retirement or healthcare benefits, no compensation of any kind, and no job. Maryland Law is settled on the matter and when a decision like that is made, the member must be returned to the full performance of their duties. As that decision has not been disturbed upon an appeal, it must certainly stand to this day. 32. Upon exhausting the administrative remedies available associated with his complaint, Plaintiff filed an employment discrimination action in this Court (RDB-08-708) pursuant to 42 U.S.C. § 1983 that was grounded in questions of federal and constitutional law. The case number is RDB-08-708. In that action, the Court dismissed Plaintiff’s complaint based on the finding that he did not state a claim upon which relief could be granted. 33. Plaintiff filed a timely motion to reconsider the determination of the Court, or in the alternative for a new trial based upon his charges that an affidavit filed by the Baltimore City Solicitor was fabricated under fraud and submitted to the Court with the express intent of having the case dismissed. That motion was rejected by the Court without any investigation being commenced to assess the truthfulness of Plaintiff’s allegation that it was fraudulent. 34. WDQ-10-0182 sought to address the continuing discrimination of defendants, however, that complaint was dismissed for res judicata. The defendants perpetrated the same fraud in the proceeding, as well, as they used the same set of facts to have that complaint dismissed. 37. The Division Chief’s signature then appears immediately thereafter. 39. As stated in the foregoing, the City of Baltimore adopted the standards of the National Fire Protection Agency for the Baltimore City Fire Department. These standards also included the physical standards regarding injuries suffered by members which would affect their job performance. The decision to not allow Plaintiff to return to his duties was made by the Medical Director for the Baltimore City Fire Department by using the standards adopted from the NFPA, which disqualified Plaintiff from the further performance of his duties, as a firefighter due to the number of surgeries he has had related to this injury. When the Medical Director basis his findings on a medically related issue, as the medical expert for the City of Baltimore, he has the final discretion over the duty status of the members and not even the Mayor can override that determination. The Civil Service Rules then become inapplicable to members of the Baltimore City Fire Department. To assert that Plaintiff did not follow the prescribed rules, to file a complaint that no action would be taken on, was just another successful attempt to obfuscate from the truth and prevail no matter what by the Baltimore City Solicitor. The true facts in this matter where of no concern of the Baltimore City Solicitor, as they have shown that they are willing to make it all up as they go along and misrepresent the facts to suit their needs. 40. Much of this Court’s opinion in RDB-08-708 focused on findings that the underlying reason Plaintiff could not proceed was that the court lacked jurisdiction to grant the relief requested because he could not prove that he exhausted his administrative remedies by filing a dispute with the City over the adverse employment action in a timely manner. Plaintiff absolutely complied with the procedures associated with filing a dispute over this adverse employment practice. Plaintiff contacted his Union representative and requested to grieve the incorrect determination of it being a Non-Line of Duty injury. This information, which is part of his employment and medical file that is in the control of the City of Baltimore, was also withheld from the hearing examiner. This would sufficiently demonstrate that a dispute with the adverse employment decision was filed, however, due to the determination being made that he was being medically disqualified under the NFPA standards, the decision was not overturned. 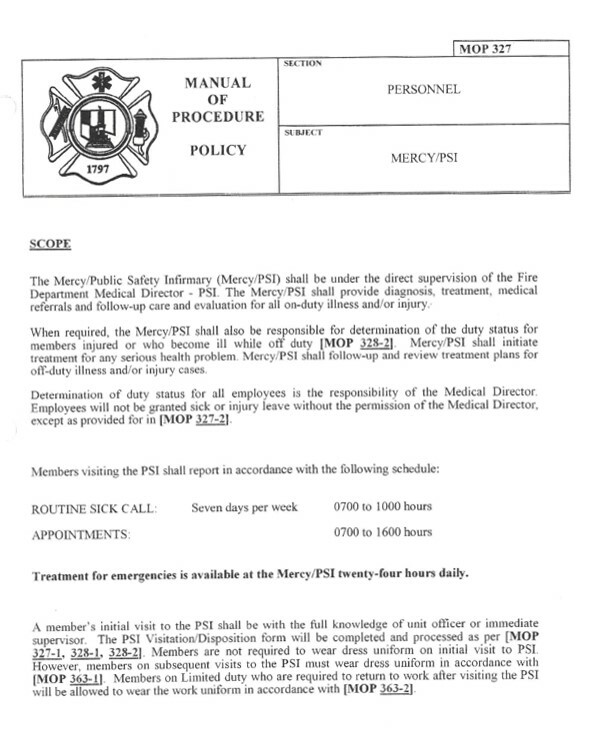 The process prescribes that once that determination is made by the City of Baltimore, more specifically, by the Medical Director of the Public Safety Infirmary at Mercy Medical Center, the member must file an application for retirement benefits from the Fire & Police Employees Retirement System of Baltimore City. If the member is aggrieved by the determination of a hearing examiner, the only avenue of relief is to file an appeal for review of the administrative decision to the Circuit Court for Baltimore City. Plaintiff filed the appeal in a timely manner and immediately thereafter, had surgery to fuse his spine. As he was recovering from the extensive spinal surgery, Plaintiff could not effectively prosecute the appeal in a timely manner and it was dismissed. While the Court contends that notice was sent, Plaintiff never received it. Plaintiff was made aware of the dismissal and once that information became known, he immediately petitioned the Court to reopen the appeal. Support for this request was demonstrated by the fact that Plaintiff was under a medical disability, as anyone would who just had surgery on their spine and could not have possibly pursued the litigation. Plaintiff was representing himself pro se in the matter. The Circuit Court denied that request. 41. Newly discovered evidence also shows that firefighters suffer from PTSD, as a result of what they encounter in the performance of their duties on a daily basis. Baltimore City firefighters see more of these horrific incidents than most other jurisdictions in the State of Maryland, by shear virtue of the number of calls for service the department receives. As stated, Plaintiff was assigned to Truck Company #1, one of Baltimore City’s busiest. It was not uncommon for Truck 1 to respond to incidents of fire daily. In one 14-hour shift, Plaintiff, along with the other members of Truck 1, responded to 4 working fires and 3 of those were multiple alarm incidents. Plaintiff has seen some extremely frightening scenes unfold before him while maintaining an outstanding record of service. He was awarded departmental commendations on many occasions, one of which was for extreme bravery related to actions he undertook in rescuing an occupant trapped in a structure fire who was engulfed in fire and was in the process of cutting his own throat because he couldn’t get out. Plaintiff removed the victim, extinguished the fire on him, and began rendering first aid until the arrival of EMS personnel for transport to the hospital. The victim later died, but as a result of his actions, and that of Baltimore City Fire Department paramedics who responded to the incident, the victim was delivered to the hospital demonstrating strong vital signs. This is just one example of many horrific encounters that Plaintiff experienced in his career. 42. There can be no argument that firefighters are exposed to traumatic incidents that are horrific, which cause them to exhibit symptoms of mental stress just by seeing them. It would be absolutely reasonable to expect that a firefighter who may suffer from symptoms of Post Traumatic Stress Disorder from seeing those horrific incidents, would be prone to demonstrating those symptoms when they become the victim themselves. By their bald and erroneous assertions, the Baltimore City Solicitor only works to promote that Plaintiff suffered some kind of diminished mental capacity, if their assertion that he just sat on his rights and gave up any attempt to redress the matter is to stand for being true. Plaintiff asserts that this is not the case. 43. This is relevant because evidence that Plaintiff sought that was in the possession and control of Defendants would have shown that Plaintiff worked for other firefighters who needed time off to attend family affairs, like holidays, baptisms, weddings, and for those that had other employment. Because of the service the fire department provides, the ability to get time off is very limited. The policies of the department allowed members to work for other members in their place. A Mutual Exchange of Tours form would be submitted and approved by the Battalion Chief. Plaintiff would then report for duty for the respective member. The City Solicitor asserted that Plaintiff “was not well motivated to return to his duties…” and the hearing examiner accepted this false assertion, without any evidence submitted to support this finding. In fact, the Mutual Exchange of Tours evidence was not submitted by the City, that was in his employment file. At the times relevant in this matter, Baltimore City Firefighters worked approximately 162 days per year. Besides working his scheduled shifts, Plaintiff worked over 150 shifts for other firefighters in the year leading up to his disqualification from duty. This evidence would have refuted their baseless assertion completely. The fact is, the City Solicitor has a long history of committing fraud in this manner and Plaintiff will present evidence and testimony from witnesses that will sufficiently support this allegation. 44. The requisite fraud on the court occurs where “it can be demonstrated, clearly and convincingly, that a party has sentiently set in motion some unconscionable scheme calculated to interfere with the judicial system’s ability impartially to adjudicate a matter by improperly influencing the trier of fact or unfairly hampering the presentation of the opposing party’s claim or defense.” Aoude v. Mobil Oil Corp., 892 F.2d 1115, 1118 (1st Cir.1989). 45. In order to meet the demanding standard for proof of fraud upon the court there must be: (1) an intentional fraud; (2) by an officer of the court; (3) which is directed at the court itself; and (4) in fact deceives the court. 46. Plaintiff alleges that the affidavit was intentionally fraudulent and was fabricated for the sole purpose of having the complaint dismissed, so that evidence that was in their possession and under their control would not be introduced. As a result, the Court could not properly adjudicate the matter. 47. It is reasonable to expect that a Division Chief for the Baltimore City Fire Department would be knowledgeable in the operation of the department, as they may be required to “act out of title” and assume the role of Acting Chief of Fire Department, upon the occurrence of an absence of the Chief of Fire Department. In fact, a Division Chief of Administration is absolutely required to be knowledgeable in this area. If not, such a person would not be qualified for the position. 48. The Division Chief, if “competent to swear oaths”, to “give testimony in a court of law”, asserts they have “personal knowledge of the matter”, and is “competent to testify” to those matters, would certainly be aware of the fact that a firefighter, who was similarly situated as Plaintiff, would have filed an appeal in dispute of the determination of the hearing examiner and be placed into a Vocational Rehabilitation Program, if an accommodation could not be made for Plaintiff’s assumed disability by the City. He would then find that a dispute was filed with the results of that effort, due to the decision of the hearing examiner that determined that Plaintiff was not disabled from the full performance of his duties as a firefighter for the Baltimore City Fire Department. 50. Of course, the fraudulent affidavit was directed at the Court itself, as it was submitted in a motion by the defense for the judge to consider whether to grant it. The motion to dismiss was meant to deceive the Court into thinking that Plaintiff “slept on his rights” when the evidence, both existing and newly discovered, contradicts that assertion. 52. Beginning on page 8, the Solicitor contended that Plaintiff did not file timely complaints to various agencies in an effort to exhaust the administrative remedies available prior to filing the action in the court. As aforementioned, Civil Service Rule 57 that requires that if a dispute with an adverse employment action exists, an employee must file it with the Civil Service Commission within 5 days of the date of that action. This is not applicable in cases where firefighters are disqualified from the performance of their duties due to suffering a disability. The fact that the medical director for the City of Baltimore has the final discretion over the duty status of members returning from duty after suffering line-of-duty injuries renders that process moot, as the medical expert for the Civil Service Commission, a Baltimore City agency, is also the medical director for the City of Baltimore. 54. This allegation is false and demonstrates the intent of the Baltimore City Solicitor to restrict Plaintiff from being able to properly present his case. Plaintiff absolutely did file complaints with many agencies of the City of Baltimore. 55. Plaintiff was deemed to be medically disqualified from his duties due to an injury that was suffered in the line-of-duty. As the process that is prescribed by Civil Service Commission Rule 57 is not applicable in this case, as sufficiently supported in the aforementioned, a member can only file an application for retirement benefits. If the member is aggrieved with the determination of the hearing examiner, an appeal to the Circuit Court is the only appropriate avenue of relief that a firefighter can pursue. As stated, Plaintiff had undergone surgery to fuse his spine and could not properly pursue the appeal because he was actively recovering from the surgery and he was representing himself in the appeal. The adverse employment action cannot occur until the appeal is decided by the court. 57. The City Solicitor’s assertion that there was a mysterious process that firefighters have to follow when they are determined to be medically disqualified from the performance of their duties by the City’s medical director is absurd, since not even the firefighter’s personal doctor can override that determination. Plaintiff did file a grievance with his union representative in a timely manner over the issue of it being deemed a Non-Line of Duty injury, but despite the exhaustive searches conducted by two individuals with demonstrated knowledge of employment practices, the City Solicitor who as a lawyer for the Mayor, would be fundamental to the duties of that office and the Division Chief of Administration and Support for the Baltimore City Department, who would have to demonstrate knowledge of employment matters related to firefighters, evidence of this could not be found. It appears that those exhaustive searches never included contacting his union to ascertain this fact. Plaintiff tried to obtain all of the evidence required to overcome this but was refused by the City Solicitor. 58. Immediately following the motion submitted by the Baltimore City Solicitor, Plaintiff filed a motion to compel the City of Baltimore to permit Plaintiff discovery in the matter in order to refute the City Solicitor’s claims, as the City had refused to accommodate it throughout all phases in the pleading process. That motion was dismissed at the same time that the complaint was dismissed for failure to state a claim. Without discovery, which was Plaintiff’s employment and medical files, he would remain unable to prevail to prove his claims of fraud on the court. 59. Since that time, additional evidence has come to light in this matter, which he could not have obtained during the time that action was filed and Plaintiff files this action requesting the Court to address whether it has been a victim of the fraud on the court, as has been Plaintiff’s fate based upon the newly discovered evidence. 60. Baltimore City firefighters engage in one of the most dangerous and physically taxing professions in the nation, wherein they regularly risk serious physical injury and face life threatening situations in service to the citizens of Baltimore City. Timely and responsibly meeting the medical and basic living expenses of firefighters who are determined to be disabled after being injured in the Line of Duty is not just a legal obligation, but a moral one. An injury such as the one that Plaintiff suffered should not result in medical conditions worsened by delay and denial of necessary benefits, nor should it leave the firefighter, or their family, financially destitute and emotionally battered. Those entrusted with maintaining the medical files related to injuries suffered in the performance of a firefighter's duties have a clear responsibility to do so, as provided for in the Baltimore City Code. In no way should the failure of officials within the City of Baltimore to properly maintain and submit the complete medical files of injured members to investigatory authorities create obstacles bound to worsen the physical and financial conditions of members of the department who have suffered debilitating injuries. Instead of carrying out these duties consistent with their legal and moral obligations, the Office of the Baltimore City Solicitor, legal counsel for the Mayor and City Council of Baltimore, routinely and improperly chooses to forward legally inconsistent arguments, withhold relevant evidence that they have in their possession, and fabricate evidence that they don't have, to unlawfully obtain a ruling from the courts that is favorable to them, so the wrongful denial of what is ultimately the City of Baltimore's obligation to the members of the Fire & Police Employees Retirement System can continue. The lack of responsible oversight allows the Baltimore City Solicitor’s long-standing pattern and practice of disability discrimination to continue at their will. 61. Complaints of criminal misconduct being committed by our elected and appointed officials are increasingly being reported, however, what is being brought to light is but a mere glimpse into the extensive role corruption plays in the operations of the City of Baltimore. The reason for its pervasiveness is the fact that very little oversight exists to control City agencies and when the discretion to exercise it is undertaken, it consistently lacks the fundamental elements required under even the minimum of accepted “best practices” standards for conducting investigations. Then, the opportunity to provide any meaningful reform in changing the public’s perception of those under-performing agencies that could result is largely missed. Investigations require more than just a phone call to any agency that is under scrutiny, in following up on a complaint to ascertain the facts, it must require more than just a cursory review. Evidence and testimony should be presented on the record, the appropriate weight of that evidence should be given full consideration, and a rational basis for any decision rendered by a finder of the fact that sets forth their legal conclusions must be submitted in writing. Simply put, the City of Baltimore falls short of observing the constitutional rights of its citizens and their employees, as the U.S. Department of Justice Division of Civil Rights found in their recent investigation into the unconstitutional pattern and practice of the Baltimore City Police Department. That report should reflect that the same findings are indicative across all aspects of City business. 62. In the context of the broad tapestry of misconduct presented by this action, there is perhaps nothing as primary and significant, as the manner in which the Baltimore City Solicitor’s office perpetrated their fraud, as they provided false and misleading testimony on the most fundamental aspects of this matter. In the following, Plaintiff intends to set forth those violations sufficiently to demonstrate that a long-standing pattern and practice of fraud is being committed by the Baltimore City Solicitor’s Office in the administration of Line of Duty Retirement Disability Benefits from the Fire & Police Employees Retirement System of Baltimore City and justify the granting of this request, as well as any and all further relief as the Court may deem necessary. 63. The fraud worked upon the court was comprised of numerous acts of misconduct and the majority of the misconduct here is clear, intentional, and willful. Together, the acts amounted to a pervasive fraud driven by the goal of prevailing at whatever the cost. The following selected examples discuss only some of the more egregious acts of fraud. 64. Article 22 of the Baltimore City Code was enacted for the purpose of providing retirement allowances and death benefits under the provisions of that subtitle for such officers and employees of the Department of Aviation, of the Police Department and of the Fire Department of Baltimore City. The City Solicitor of the City of Baltimore is the legal advisor of the Board of Trustees of the Fire and Police Employees Retirement System of Baltimore City. Firefighters who are disqualified from the further performance of their duties by the City of Baltimore are ordered to file an application with the Board of Trustees of the Fire and Police Employees Retirement System of Baltimore City. The Board of Trustees is responsible for conducting hearings on all matters involving non-line-of-duty disability claims, line-of-duty disability claims, 100% line-of-duty disability claims, line-of-duty death benefit claims, and any related matters arising out of these claims. One hearing examiner from the Panel of Hearing Examiners, provided for by the Board of Estimates of Baltimore City hears claims for benefits and conducts the hearings in an informal manner, with sufficient latitude to provide a fair and impartial hearing to all of the parties without requiring strict compliance with the rules of evidence. Testimony at the hearing is under oath and recorded. The hearing examiner has the power to subpoena and require the attendance of witnesses and the production of papers and documents to secure information pertinent to the hearing, and to examine them. 65. While the Baltimore City Code does not require a strict compliance with the rules of evidence, for matters before the Panel of Hearing Examiners, it does not effectively throw them out to allow the Baltimore City Solicitor to have complete control over the process or to disobey state law on the issue. Under the Administrative Procedures Act of the State of Maryland Subtitle 10-213 (b), it provides that the presiding officer may admit probative evidence that reasonable and prudent individuals commonly accept in the conduct of their affairs and give probative effect to that evidence. Probative evidence is that which has the effect of proof, tending to prove, or actually proves the elements of a case. It is obvious that the City Solicitor has taken full advantage of this rule and has used it to admit evidence that is totally irrelevant. It also does not allow the Baltimore City Solicitor to withhold probative evidence. 66. The record submitted as evidence shows that not only was irrelevant material introduced, which can only be viewed as an attempt to convolute the record and cause confusion, relevant and probative medical evidence was willfully withheld from inclusion. This includes virtually the entire incident that led to Plaintiff being medically disqualified a second time. This information was vital to Plaintiff being able to prevail at the hearing before the F&PERS. This information was excluded because it was favorable to Plaintiff’s case and it was withheld purposely to ultimately deny him of his retirement benefits. 67. The incident that has given rise to this action was the direct result of the performance of Plaintiff’s duties, as a firefighter. Plaintiff was assigned to Truck Company 1, Oldtown Station, which covers the lower eastside business district in downtown Baltimore City. Truck Company 1 is consistently ranked among the busiest Truck Companies in Baltimore, responding to over 3,000 calls for service every year. No evidence submitted, other than what has been pled throughout the litigation that has occurred in this matter, offers any details into how the original injury was suffered. 68. On August 2, 1996, at approximately 5 P.M., a fire was reported in an office building in the 600 Block of N. Davis Street and a box assignment was “struck out” by the Communications Division of the Baltimore City Fire Department. A box assignment consists of 4 engine companies, 2 truck companies, a battalion chief, and an air-flex and medic unit. Truck Company 1 arrived on the scene first and reported smoke showing from all floors of a 5-story building in the rear of that location. Plaintiff, along with other members of Truck Company 1, put ground ladders in place and entered the building to search for trapped occupants, to ventilate the structure, and to provide access to the seat of the fire for incoming engine companies. Upon entering the building, Plaintiff encountered extremely dense smoke and intense heat. He made his way to the 5th floor stairwell, after performing a primary search of the rest of the building and was about to enter that floor when he heard an engine company advancing their hose-line from the floor below to his location. This is typical of aggressive interior firefighting operations that are necessary to limit the fire from extending to adjoining structures. Plaintiff utilized a ceiling hook, a specialized tool for firefighting, to penetrate the ceiling and exposed the seat of the fire in that space. Due to a delay in getting the charged hose-line in place, the fire progressed very rapidly due to it being exposed to more air and the area “flashed over”. A flashover occurs when the internal temperatures are sufficient enough to ignite the flammable gases that occur, as a result of the thermal layering of those gases in enclosed spaces. The force of the simultaneous combusting of those gases was enough to send Plaintiff over a railing and down the stairwell to the first floor. Plaintiff hit the ground with enough force that it caused the separation of components of his helmet to occur. The incident escalated to 5 alarms, which should sufficiently show the severity of the fire and the severity of the mechanism of the injury suffered, rather than what is represented in the record before the Panel of Hearing Examiners for the Fire and Police Employees Retirement System of Baltimore City. The only details that were provided were narratives by medical professionals, but none submitted by the City of Baltimore that is reflective of the full details of the incident. 69. Plaintiff more than tripped over a hose-line, as is demonstrated in the application. Plaintiff did not write that on the form and no Employee Incident Report is introduced into the record, despite Maryland Law requiring one to be completed. If probative evidence is required to be introduced, the injury report would be essential. Why this was withheld has never been addressed. 72. It was impossible for Plaintiff to be working out with weights on May 8, 1999, when the record clearly shows that Plaintiff was already placed off duty on March 23, 1999 for an injury associated with the Line of Duty that occurred on August 2, 1996, which would ultimately require surgery. There is no evidence in the record of an incident occurring on May 8, 1999. As previously mentioned, this decision was appealed, due to the hearing examiner’s error and Plaintiff was reinstated to his duties. The City of Baltimore contends that Plaintiff wasn’t happy with the hearing examiner’s decision and he chose to return to his duties. This is simply not true and is a total misrepresentation of the facts knowingly for the direct purpose of confusing a finder of facts of those facts. The Baltimore City Solicitor knew of the decision of the Chief of Fire Department to reinstate Plaintiff due to the error that was made and the appeal pending in the Court to address it due to the possible legal liability it posed to the City of Baltimore. The Hearing Examiner was obviously biased and was motivated to deny Plaintiff out of his rightful benefit, or from returning to the performance of his duties, and abused his discretion. 73. After having problems someone typically has after suffering from an injury like this and suffering further injury to the spinal column resulting from having such an invasive surgery, Plaintiff again experienced pain, on several occasions both in the Line of Duty and Non-Line of Duty in the location of the previous injury in 2002, which led to his being deemed medically disqualified from the performance of his duties by the City of Baltimore a second time. Plaintiff was ordered to apply for Special Disability Retirement Benefits from the Fire and Police Employees Retirement System of Baltimore City. A second hearing was conducted, in the same procedure as that aforementioned in the occurrence of the first proceeding, before the same hearing examiner that made the erroneous determination in the first hearing. The City of Baltimore was represented by the Baltimore City Solicitor. Plaintiff was not represented by counsel. Plaintiff was determined to be “not disabled from the further performance of the duties of a firefighter” and he was again denied Special Line of Duty Disability Retirement Benefits. 76. This assertion is absolutely false, and the misrepresentation of this fact is done knowingly and willingly by the City Solicitor. Plaintiff was determined to be medically disqualified using the physical standards for firefighters, as prescribed in NFPA 1582 Section 9.9.8.1 Spine Structural Abnormality, Fracture, or Dislocation. These policies and standards were accepted by the Baltimore City Fire Department and utilized by the City of Baltimore to deny Plaintiff from continuing the further performance of his duties. If the entire medical record would have been introduced, and the probative evidence given the weight required by law, it would demonstrate that Plaintiff was ready to return to duty, as he had felt as though he recovered sufficiently to return to his duties in the abbreviated time allowed due to the incorrect classification of this injury being a Non-Line of Duty occurrence by the City of Baltimore. Plaintiff reported this to his doctor who noted that “Brian is anxious to return to work, so I think it is appropriate to do so.” Plaintiff then reported to the medical clinic for the City of Baltimore and informed Dr. Lyons that Dr. Rybock was preparing to release him to duty. Dr. Lyons then consulted with the medical director for the City, Dr. James Levy, who determined that Plaintiff was to be medically disqualified from returning to the further performance of his duties as a firefighter. Plaintiff reported this to his doctor who noted in his next report the fact that he was being retired. 77. The hearing examiner, upon the occurrence of the hearing, asked if a Functional Capacity Examination, or an FCE, was performed in association with the determination of the City to medically disqualify him for the further performance of his duties. An FCE was not submitted because the City of Baltimore never scheduled Plaintiff to be examined prior to his Cut Off date of December 28, 2002. An FCE was conducted in March of 2003, as part of the Vocational Rehabilitation process. Plaintiff offered that an FCE was conducted but well after his Cut Off date and was inappropriate to utilize at the hearing, as evidence shows that Plaintiff was awaiting to have a further surgery for the injury at the time the FCE was conducted and the City failed to submit any evidence related to it to the hearing examiner. 79. As Plaintiff was awaiting the extensive spinal reconstructive surgery which took place in October of 2003, it is inconceivable that anyone could demonstrate anything other than self-limiting behavior, in an examination to test their capacity to perform work, just prior to surgery. As is reflected in the letter, “the FCE occurred 3/11/03,” well after Plaintiff’s “Cut-Off” date of 12/28/02. As this FCE was conducted for the purpose of the Vocational Rehabilitation plan, to assess Plaintiff’s physical ability to do work, the representatives who performed this examination were not aware of the fact that Plaintiff was awaiting to have surgery at the time of that examination. 80. Plaintiff was still subjected to the administrative hearing process, despite being under the care of his doctor, as he was recovering from extensive spinal surgery that included the fusing of the vertebral discs that were affected. This evidence was not only withheld from the administrative hearing examiner, but other professionals involved his case, despite the fact that the City of Baltimore was paying the costs of the Vocational Rehabilitation program. This permits the Baltimore City Solicitor to fabricate the record as they need to in order to obtain a ruling that is favorable to them. This information was withheld from the hearing examiner for that exact purpose. 82. Dr. Halikman is a doctor employed by the City of Baltimore to offer opinions on cases that involve an employee’s disability who are undergoing the retirement process, such as Plaintiff underwent. It is obvious that evidence of Plaintiff’s medical file, which held relevant and important information relating to this injury, was withheld from even Dr. Halikman. As for Dr. Halkiman’s uncertainty as to whether Plaintiff was disabled, obviously, he is unaware that the medical director for the City of Baltimore made this determination under the standards found in NFPA 1582, relating to firefighters who are seriously injured in the Line of Duty and wish to return to duty. Plaintiff, nor his treating physician, ever asserted that Plaintiff was disabled. 84. Plaintiff originally injured his back on 8/2/96. Plaintiff was subject to retirement in 2000 because of the injury and was denied benefits, as the hearing examiner determined that Plaintiff had sufficiently recovered from that injury enough to return to work and perform his duties for a considerable time after that. There was evidence that a herniated disc, that was evident in the original occurrence had progressed but could not be the cause of Plaintiff’s pain. It was found to be the scar tissue that had accumulated over the time since the first surgery and had to be considered a new injury rather than just a recurrence. If not, the Plaintiff could not have recovered sufficiently, as evidence shows he had the scar tissue accumulating the entire time, which all evidence to the contrary would then show that Plaintiff had not recovered from that surgery. 86. In both of these instances there is no attempt of Plaintiff to be considered non-credible in his testimony before the hearing examiner. This is just another misrepresentation by the City Solicitor to stack the deck in the City of Baltimore’s favor. 88. As Plaintiff testified before the hearing examiner, the FCE required for the purpose of the hearing for retirement disability benefits should have been scheduled by the medical director for the City of Baltimore before the “Cut-Off” date of his employment with the City of Baltimore on 12/28/02, as mentioned by the City Solicitor, but it wasn’t. Plaintiff had no obligation to do this or provide it. The question of it not being submitted to the hearing examiner was a question for the City of Baltimore to provide testimony on and not by their attorney. 90. Again, the City Solicitor takes the evidence and the entire hearing off the rails and into a realm of make believe. As aforementioned, Plaintiff did not “miraculously” return to work because he was not awarded the more lucrative line of duty benefit. Plaintiff was reinstated to his duties, as a result of an appeal that was filed challenging the decision of the hearing examiner. At no point did Plaintiff ever decide anything, as far as his ability to perform his duties. Plaintiff’s retirement was decided by the medical director for the City of Baltimore. 91. The entire letter that was submitted as part of the record by the Baltimore City Solicitor is a total fabrication of the facts and should not have been allowed to be introduced. 92. Despite the fact that this injury was suffered in the Line of Duty, and the policies that governed how injuries were assessed under the NFPA’s physical standards adopted by the Baltimore City Fire Department, the hearing examiner ruled that Plaintiff was not disabled from the performance of his duties. Upon his release from his doctor’s care for the surgery, as is reflected in Biscoe v. Baltimore Police Department (citation omitted), Plaintiff requested to be reinstated to his position as a firefighter in the City of Baltimore, of which the City denied. Plaintiff then began the process of disputing the determination of the City to deny him the ability to return to his duties due to employment discrimination with the EEOC. After waiting a period of time for a “Right to Sue” letter from the EEOC but not receiving it, Plaintiff made a request to them to issue it. This request was granted, and Plaintiff then filed a lawsuit in this Court. 93. Upon the filing of the complaint, and the subsequent Motion to Dismiss that was filed by the City of Baltimore, Plaintiff attempted to comply with the Federal Rules of Civil Procedure in the attempt to obtain evidence that was contained in his employment file that was withheld by the City Solicitor in the proceeding before the administrative hearing examiner. The Baltimore City Solicitor denied this request and informed Plaintiff that he would need to file a Freedom of Information Act request in order to get it. 94. The City Solicitor then refers to this as if it was a “wrongful termination” claim and goes on to assert that a dispute had to exist when no dispute could exist until a determination was made by the hearing examiner. The only individual that can overturn the determination of the medical director for the City of Baltimore is the hearing examiner and if necessary, this Court. To characterize this process as something that was required can only be seen as a way for the City of Baltimore to create obstacles for firefighters who are disabled from the performance of their duties and is absurd. When Plaintiff filed his grievance to dispute the incorrect classification of this as a Non-Line of Duty injury, his union representative explained that the action was being taken due to the NFPA standards disqualifying him from his duties for the number of surgeries performed. It was further explained that the next injury that could occur would be catastrophic, as Plaintiff’s physical health relating to his back had been compromised by not only the surgeries but the infection, as well. As the action was being taken legally, with regard for the future health of Plaintiff, there was no dispute until the abuse of discretion demonstrated by the hearing examiner that denied Plaintiff of his benefits. A “termination” of Plaintiff would indicate that a violation of the rules regarding his employment had occurred that was his fault. There is no evidence of this occurring, so it must be, as the City Solicitor points out, a breach of the Mayor and City Council’s obligations under Article 22 of the Baltimore City Code, which is the provision that establishes a member’s contractual property right to their appointed position. This property cannot be taken away except by due process of law. If it was a “termination” matter, Plaintiff was never afforded the pre-termination and termination hearings, as mandated by law. This only further demonstrates that due process rights are not upheld by the City of Baltimore. 95. Plaintiff was ruled to be not disabled from his duties, as a firefighter for the City of Baltimore by the hearing examiner. While this decision is contradictory to the NFPA standards the medical director utilized to disqualify Plaintiff from the further performance of his duties, he demanded that he be returned to his position, as a firefighter for the City of Baltimore with all of his seniority in-tact. He made this request to the representative of the Vocational Rehabilitation contractor that was assessing his ability to be employed outside of the fire department. As the hearing examiner’s determination was that Plaintiff was not disabled from the performance of his duties, and it has not been disturbed upon any appeal to this date, there is nothing that denies Plaintiff from his contractual right to his position, as is reflected in Article 22 of the Baltimore City Code. For the City to characterize the appeal in the first occurrence to not be pursued and withdrawn, as if no action by the City was taken on it, is a fabrication of the truth that is well known by the City Solicitor. Plaintiff was reinstated to his duties by the Acting Chief of the Fire Department in response to the appeal filed challenging the hearing examiner’s decision. When Plaintiff was reinstated, as he did not want to be retired in the first place and never asked for it, the appeal was settled and there was no need to pursue it. 97. The appeal was not dismissed due to it being untimely, as the City Solicitor asserts and goes on the record to provide testimony that it was dismissed for that reason. If the complete medical record and probative evidence was properly introduced by the City Solicitor, that evidence would show that while the appeal was pending, Plaintiff underwent extensive spinal reconstruction surgery to fuse his vertebrae. This is a willful misrepresentation of the facts by the City Solicitor again. 99. When Plaintiff filed his grievance to dispute the incorrect classification of this as a Non-Line of Duty injury, his union representative explained that the action was being taken due to the NFPA standards disqualifying him from his duties for the number of surgeries performed. It was further explained that the next injury that could occur would be catastrophic, as Plaintiff’s physical health relating to his back had been compromised by not only the surgeries but the infection, as well. As the action was being taken legally, with regard for the future health of Plaintiff, there was no dispute until the abuse of discretion demonstrated by the hearing examiner that denied Plaintiff of his benefits. 101. With that exchange with the court, the Baltimore City Solicitor asserted that, “And there have been meetings with the City Solicitor, with the Office of the Mayor, with the President of the City Council, with the new police chief. So, I would just like to say, and this is completely off the record that there have been extensive, extensive efforts to accommodate Mr. Vaeth.” All evidence is to the contrary. At no time was an accommodation even attempted. However, the Baltimore City Solicitor was permitted to utter this misrepresentation and it was accepted by the court without even as much as any evidence to support that assertion whatsoever. 103. When this evidence was brought forth, the City Solicitor explained that former Chief Goodwin was fired, and his credibility was in question. When Chief Goodwin announced his retirement from the department, he disclosed that it was due to the illness of a family member. Why would this fact raise questions as to the credibility of a former Chief of the department, with an exemplary performance record, is a fact unknown to Plaintiff and is wholly unreasonable to accept. 104. Evidence that is in the City of Baltimore’s control, in the form of his employment file, would show that Plaintiff requested that if he was to be disqualified from the further performance of his duties by the medical director under the standards adopted by the City of Baltimore, that he be assigned to a non-suppression function in the Air Mask Repair Division, as an open spot was pending due to another member’s retirement. All attempts to accommodate this request were being considered by the City of Baltimore until the decision of the hearing examiner. At that point, all requests for accommodation were denied. 106. That request was denied by the Baltimore City Solicitor, despite the finding that he was improperly terminated by the Mayor’s Office. 107. Despite this many firefighters who have suffered the same fate as Plaintiff were accommodated and were afforded the ability to maintain their service for retirement purposes by being placed in light duty positions. This would allow them to remain in the employment of the City, maintain their membership in the retirement system, and work until they reach the service requirement to be eligible for a pension. They have obviously confused themselves with a case involving another member of the fire department and not that of Plaintiff. The assignment of firefighters to these light duty positions are done based upon favoritism and not reflective of the requirements of the Americans With Disabilities Act. 108. Plaintiff was so diligently being accommodated that an email Plaintiff received from the Chief of the Baltimore City Fire Department, Mr. William Goodwin, was very telling, as to the true level of cooperation demonstrated by the Baltimore City Solicitor’s Office. Upon his reinstatement after the disputed findings of the first retirement hearing, the Chief shows that he was told to fire Plaintiff. Plaintiff was subject to retraining at the Baltimore City Fire Academy and had passed all aspects of that training required to be reassigned to his original duty status. Chief Goodwin demonstrated that he would not violate the law and he reassigned Plaintiff to his original duty assignment despite this. 109. When Plaintiff was ruled by the hearing examiner to not be disabled from his duties, he should have been restored to his duties, under the law, but he was not. Since he was not disabled, as the hearing examiner ruled, and that determination is presumptively correct if not disturbed upon appeal, which it has not been, the City of Baltimore would not have any other justification for restricting Plaintiff’s right to continue with the performance of his duties. 110. As a result of the in-custody death of an arrestee while being detained by Baltimore City Police Officers, the US Department of Justice performed an investigation into the unconstitutional pattern and practices of the Baltimore Police Department. The report depicted the Baltimore Police Department’s unconstitutional pattern and practices, as a more of culture that did not uphold standards of investigatory best practices which led to excessive abuse complaints against officers being disregarded. These complaints involved the constitutional violations found in the US DOJ investigations and yet the City of Baltimore was successful in prevailing in lawsuits filed against them. The Baltimore City Solicitor’s Office represents the Mayor and the City Council, as well as Baltimore Police Officers in these lawsuits. At the same time, an Associated Press review of hundreds of court records nationwide revealed patterns of similar misconduct and unethical behavior involving municipal attorneys in New York, Denver, as well as Baltimore. They found that these lawyers deliberately hid important facts, delayed their disclosure or otherwise sought to subvert evidence in civil cases. In August of 2016, right after the findings were released by the USDOJ, Mr. George Nilson, the Chief Baltimore City Solicitor was fired without explanation. (H/E): "I don't like gotcha games. I think everybody should be able to put on their case, and they should be able to put forth the best case. But I don't like you sitting here and saying you had a document you've had since Sept. 2, 2015 and you won't even give it at the beginning of the hearing. I have a problem with that." (CITY): "There's no discovery rules"
(H/E): "I have a problem with that." (CITY): "It's perfectly permissible within the discretion of the Fire and Police Employees Retirement." (H/E): "And if Mr. Gordon was sitting here doing that right now you'd be standing on your head telling me that I absolutely cannot take a document that he held out and that he kept it away from the other side." (City): "Again, this is within the standard practice of what the F&P does in cases where we're investigating an issue of credibility. This is not exceptional. We've done this in prior cases, you know. This is not anywhere against the regulations or rules, and it's completely permissible." HEARING EXAMINER: "I don't like gotcha games. I think everybody should be able to put on their case, and they should be able to put forth the best case. But I don't like you sitting here and saying you had a document you've had since Sept. 2, 2015 and you won't even give it at the beginning of the hearing. I have a problem with that." CITY SOLICITOR: "There's no discovery rules"
HEARING EXAMINER: "I have a problem with that." CITY SOLICITOR: "It's perfectly permissible within the discretion of the Fire and Police Employees Retirement." HEARING EXAMINER: "And if Mr. Gordon was sitting here doing that right now you'd be standing on your head telling me that I absolutely cannot take a document that he held out and that he kept it away from the other side." CITY SOLICITOR: "Again, this is within the standard practice of what the F&P does in cases where we're investigating an issue of credibility. This is not exceptional. We've done this in prior cases, you know. This is not anywhere against the regulations or rules, and it's completely permissible." 113. This demonstrates that the withholding of evidence is a common practice for the Baltimore City Solicitors Office in matters before the Panel of Hearing Examiners for the Fire and Police Employees Retirement System of Baltimore City. 114. The actions taken as a whole constitutes an egregious fraud that is being committed by the City of Baltimore, accommodated by the Baltimore City Solicitor, that permits them to continue to perpetrate their fraud while making it seem like a mere harmless error because they, in effect, have control over the entire process. In the areas they don’t control, their fraud is easily perpetrated because of the extraordinary trust the courts have placed in these attorneys. The Baltimore City Solicitor operates in such a manner as to deny responsibility for paying on injuries and having the bills then sent to the member’s private health insurance company for payment. In some instances, those bills are incorrectly paid by the private insurance company of the firefighter. This has occurred several times in Plaintiff’s case and is supported by the documents contained in cases of firefighters being ordered to report to the medical clinic for the City of Baltimore for following up on injuries, or for sick call, the private health insurance provider for the firefighter is billed. These actions constitute a fraud committed by the Baltimore City Solicitor’s Office on the private healthcare insurance industry. The failure of the City of Baltimore to pay those bills has resulted in Plaintiff being restricted from receiving healthcare services. 115. It is inconceivable that an employer can get away with such misconduct but to permit those actions to encroach upon the liberties of a person exercising the human right to access appropriate healthcare is beyond the reasonable understanding of the Plaintiff. The City of Baltimore has consistently acted in bad faith by ignoring that the methods they used to investigate claims and conduct hearings to decide compensability do not accurately reflect the ethical standards for doing so by producing false evidence and counsel’s opinion, offered as testimony on the record before the Panel of Hearing Examiners and eventually the Court. As officers of the court, attorneys are afforded a bit more trust in matters before the courts because they are the ones responsible for seeking justice and finding the truth. It is the fundamental purpose of justice itself. Without truth, there can be absolutely no justice. When there is no truth, fair and equal no longer becomes part of that equation either. When rulings are issued on cases wherein the Baltimore City Solicitor has possession of all of the evidence and they disclose just what they want to and not what is relevant, and are willing to fabricate what evidence they don’t have just to obtain a ruling that is favorable to them, what is left is a version of justice that rewards unethical behavior and only empowers them to carry on the continuing pattern and practice of prejudicial and discriminatory violations of the law that are apparent in this case, and the cases of many other members of the Baltimore City Police and Fire Departments similarly situated. 116. The specific relief Plaintiff seeks in this action, after being permitted the opportunity to present sufficient existing and newly discovered evidence to the Court to prove that the City of Baltimore has committed fraud upon the court. This action does not seek the restoration of Plaintiff’s disability retirement benefits but addresses the matter of the fraud that was committed and seeks the Court to assess whether they have been a victim of that fraud, so the Court can perform its primary function and properly administer the appropriate justice that is required. 117. Plaintiff respectfully requests a hearing to submit the extreme amount of newly discovered evidence that the rules discourage presenting at such an early stage of pleading. This evidence is crucial to assessing this matter in full. I, Brian Charles Vaeth, solemnly affirm under the penalties of perjury that the contents of the foregoing complaint is true to the best of knowledge, information, belief this 31st day of May 2018. I, Brian Charles Vaeth, hereby certify that a copy of the foregoing complaint has been mailed to counsel for the City of Baltimore via USPS first class, postage prepaid, this 31st day of May 2018. Amendments to Section 34 (c) of Article 22 by Ord. 03-576 do not cover this claim.